Has decay or structural damage weakened one or more of your teeth? We can help you restore your smile’s strength and appearance with one or more dental crowns. A dental crown is a custom-made restoration that’s placed over a compromised tooth to preserve both the tooth and the root underneath. With a custom-made crown in place, your tooth functions like a natural tooth again but it also resembles a natural tooth again. Treatment with traditional crowns typically requires at least two visits: one to prep the patient’s tooth and design the new restorations and a second to attach the patient’s finished restoration. If for some reason that patient’s temporary crown breaks or falls out in between these two visits, additional care may be necessary. Treatment with CEREC is totally different. 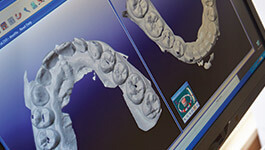 Using a CEREC in-office milling unit enables us to provide the same quality service in only one appointment instead of the two or three visits that can be necessary with a traditional crown. Over the course of a single appointment, Dr. Schumacher preps your tooth, designs your crown, and places a fully customized restoration. Afterward, you’ll leave our office with a fully restored smile you love. Call our Wakefield dental office if you’d like to learn more about the revolutionary CEREC milling unit or if you’d like to schedule an appointment with our team.